For the past month, African football teams have been playing in the African Cup of Nations, the equivalent of the World Cup for the African continent. The final game was Sunday February 8th, between Ghana and Cote D’Ivoire. It was a dramatic match, with Cote D’Ivoire winning 9-8 in a penalty shootout following a scoreless game. 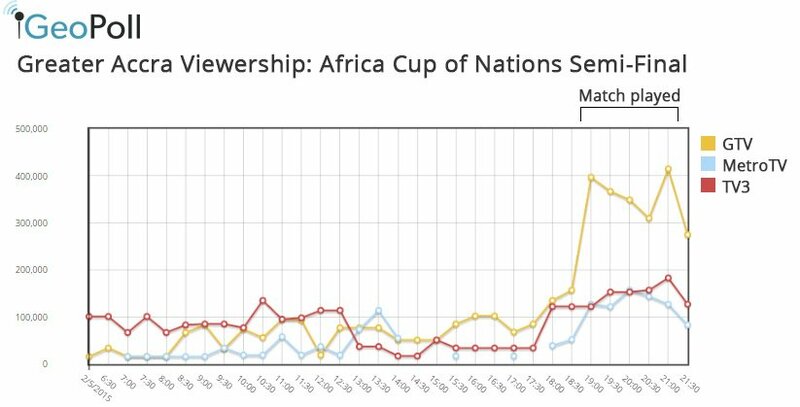 Through GeoPoll’s Media Measurement Service we examined the viewership numbers for the final match, finding that nearly 3.7 million Ghanaians tuned into the event. The final match aired on GTV, TV3, and MetroTV, with 3,644,000 viewers tuned in at the peak of the match at 9pm. Viewership was high throughout the match, but went up as it went into extra time and then a penalty shootout. At the beginning of the game at 7pm, 3,392,000 viewers were watching, and audience size climbed to 3,624,000 at 8:30pm and 3,644,000 at 9pm. Throughout the match, viewers were quite evenly split between GTV and TV3, with TV3 drawing slightly more viewers at 8:30pm, and GTV having a higher audience size at 9pm. MetroTV had a maximum audience of 278,000 at 9:30pm. Viewership was also high for the semi-final match on February 5th, when Ghana beat host nation Equatorial Guinea 3-0, and fan riots stopped the match for 40 minutes with only 10 minutes to go. During that game, viewership peaked at 3,093,000 at 7pm. Interestingly in the Greater Accra Area, viewership went down from 8pm – 8:30pm, and then up again at 9pm, which may indicate viewers in Accra heard about the riots and tuned back in to see what was going on. At 9pm on February 5th, there were 725,000 viewers in Greater Accra watching the match. Learn more about GeoPoll’s Media Measurement Service here, and click below to get a demo of our platform and data in Ghana, Kenya, Tanzania, Uganda, Mozambique, and Nigeria.